In episode 8 of Directional, Myke and Federico briefly mention that they would try to list a Top 5 of their favorite video games in a future episode of the podcast. I thought it was a great idea! Fact is, however, it’s simply impossible. In the 25 years I’ve been playing, there have been too many good titles. I have accumulated over 54 games accross 8 consoles – not counting several games I have sold, and regret having done so, and also not counting dematerialized games on PS3, 3DS, Wii, Steam, iOS and OS X.
January 2013. A couple of 3DS and PS3 games have been added since. I will never get bored of Tetris. 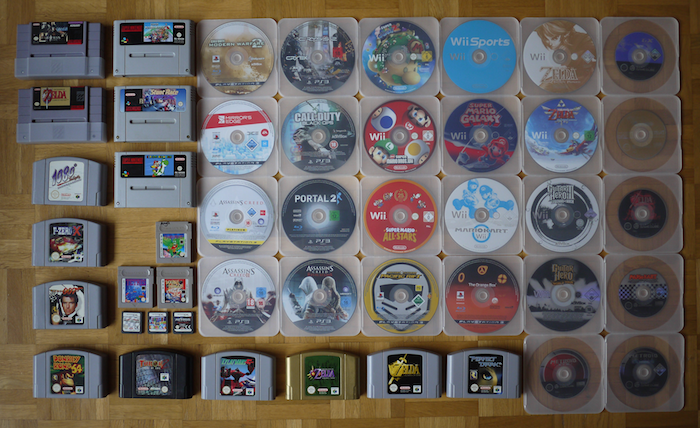 Super Mario Kart and Goldeneye 007 are up there because they probably are the games I spent most time playing. Countless hours challenging my cousin in time trials and balloon popping multiplayer on Super Mario Kart. For Goldeneye 007, we even had a special setup where we would hook up 2 TVs to the Nintendo 64 – which is actually pretty easy with an antenna cable splitter. The TVs would be placed back to back, and each of the two players would cover half of the screen to hide the opponent’s point of view. Metroid Prime is listed because I simply loved the athmosphere of the game. Come to think of it, I have to play it again some time. And finally Portal 2 is the only recent game I finished more than once because I enjoy it so much. I think that nobody will dispute that Ocarina of Time and Half-Life 2 are masterpieces. Super Mario 64 was the first game I owned for the Nintendo 64. It was surreal at the time, for me at least. F-Zero X is in the Top 10 for the same reasons as Super Mario Kart and Goldeneye 007. I have spent so much time with my cousin playing it. Sometimes I miss our gaming sessions. We played Modern Warfare 2 a couple of times online in co-op, but it’s just not the same. Assassin’s Creed I was pretty good but had too many repetitive tasks. I much prefer the second installment.